Boss Bottled Collector's Edition is a unique limited edition of Hugo Boss. 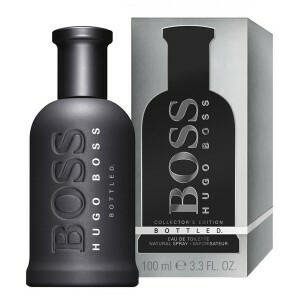 Boss Bottled Collector's Edition 100ml. Eau De Toilette is a remake of the collector composition BOSS Bottled. Repeats the flavor of the original, it has been issued in a black bottle, whose design draws inspiration from the elegance of the classic men's coat. Fresh top notes with hints of apple and citrus balanced with nice spicy flavors "heart" with a predominance of geranium, cinnamon and cloves. Restrained, elegant chords of sandalwood, vetiver and cedar-based compositions provide frank disclosure masculine base notes and warm notes of vanilla perfume gives a unique style. A fragrance for men, belongs to a group of flavors spicy wood. This is a new fragrance, Boss Bottled Collector's Edition released in 2014. Top notes are plum, bergamot, green apple, oak moss and geranium; Heart notes of mahogany, cloves and cinnamon; base notes are sandalwood, white cedar, vetiver, vanilla and olive tree. The Fragrance The BOSS man is primed to succeed competitive, driven & ambitious. His daily preparation rituals are integral to his personal quest for success and BOSS Bottled has become an established part of his daily armour.